"'In this contemporary fantasy, the grieving biographer of a Victorian fantasist finds himself slipping inexorably into the supernatural world that consumed his subject. American Charles Hayden came to England to forget the past. Failed father, failed husband, and failed scholar, Charles hopes to put his life back together with a biography of Caedmon Hollow, the long-dead author of a legendary Victorian children's book, In the Night Wood. But soon after settling into Hollow's remote Yorkshire home, Charles learns that the past isn't dead. In the neighboring village, Charles meets a woman he might have loved, a child who could have been his own lost daughter, and the ghost of a self he thought he'd put behind him. And in the primeval forest surrounding Caedmon Hollow's ancestral home, an ancient power is stirring. The horned figure of a long-forgotten king haunts Charles Hayden's dreams. And every morning the fringe of darkling trees presses closer. Soon enough, Charles will venture into the night wood. Soon enough he'll learn that the darkness under the trees is but a shadow of the darkness that waits inside us all." In the Night Wood is a contemporary fantasy with a strong premise that unfortunately fell flat for me in the end. It had moments of magic and intrigue, but these were somewhat rare when packed between a--at times--seemingly non-existent plot. When Charles Hayden was a young boy, he stumbled upon a book called In the Night's Wood, a children's fairy tale book that, as many fairy tales tend to do, carried with it much darker themes and frightening images than most children would appreciate. This imagined book is where the story begins, how Charles eventually meets his wife, and how he eventually ends up living in the house of Caedmon Hollow the author of the infamous book itself. The made-up children's book In the Night Wood is the most interesting part of this entire storyline, along with the forest surrounding the Hollow estate. These elements are where the book shines with an unexplainable darkness tinged with magic and myth. There is a mystery at that heart of this story that Charles explores, a mystery that I found myself drawn to and looking forward to uncovering. 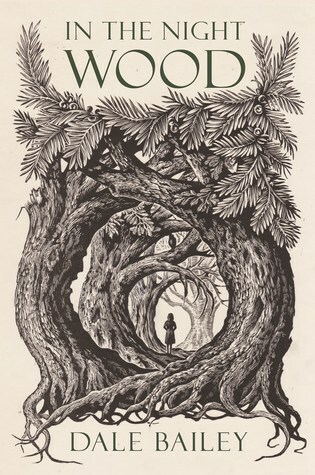 At the beginning of various parts of the story, Bailey would insert an extract from the fictional In the Night Wood fairy tale that I loved and that I wish I could just sit and read in its entirety. Another positive component to this book is Bailey's writing itself, as the prose itself is consistently beautiful throughout the entire book. I knew from reading only the first few pages that whether the plot and characters were good or not, this book would still be well-written, and that is something that did hold true. I highlighted many passages within In the Night Wood and truly enjoyed Bailey's prose. Unfortunately, the rest of the story wasn't quite as engaging as those aspects. The story is as much a character study of Charles, his wife, and their marriage as it is a story about Caedmon Hollow and his story--if not more. I struggled with this because I do enjoy books that focus heavily on characters, but in this case it was simply too repetitive and monotonous for me to enjoy. I was hoping for much more to discover in this book, and instead I was met with a rather dry account of a grieving couple--not a bad thing, but not how this book was advertised. Charles and his wife, Erin, are struggling with Charles' previous affair, the death of their young daughter, and now their struggling marriage that is the result of the former two events. I fully understand that losing one's child is a devastating, tragic event, and it's understandable that these two would be struggling. However, too much of this narrative was concerned with relentlessly commenting on their daughter--and not even on new things about their daughter, but rather the same ideas, the same images, the same sentiments. It was simply too monotonous to fully enjoy, and I became tired of Erin's stubbornness to accept any help offered. I wanted a little bit more development or insight rather than the same things mentioned over and over again. The ending was both satisfying and lacking at the same time--I appreciate how things were wrapped up and the conclusions that were reached, but it also seemed to happen much too quickly. The story doesn't really have much forward motion throughout the book, so the climactic ending was both too long coming and too quickly taken care of. I wish that there had been a bit more content in the middle of the story to better prepare the story for the ending. Overall, I ended up giving In the Night Wood 3.5 stars. Parts of this book I really loved, and parts were just tedious to get through. I would recommend this to anyone who doesn't mind a slower paced back that still packs in some dark, imaginative fairy tale elements. I love the concept for this book, and it could have been really amazing. Too bad the execution wasn't great, and it definitely sounds like too much focus on the marriage!